to raise new questions about cosmic 'inflation'. is leading some physicists to question the standard model of cosmology. When the European Space Agency’s Planck mission team unveiled the most detailed map yet of fluctuations in the cosmic microwave background - the afterglow of the Big Bang - in March, the map was seen as in line, for the most part, with the standard theory of cosmology. But now, a controversial analysis combining the Planck findings with recent data about the Higgs boson paints the prevailing theory in a dim light. According to the preliminary analysis of the space observatory's data published on the arXiv preprint server,1 the precise temperature patterns detected in the cosmic microwave background, or CMB, support the predictions of standard cosmology - that soon after the Big Bang, the early Universe underwent a short burst of exponential expansion known as inflation. Proposed in the 1980s, inflation explains why patches of the CMB that today lie at opposite ends of the observable Universe have similar temperatures. The argument is that these far-flung regions were in close contact and thus shared physical properties before the cosmic growth spurt of inflation drove them apart. Cosmologists do not understand exactly what would kick-start inflation. But they believe that the state of the Universe is determined by the interplay of a number of cosmos-pervading fields, including the Higgs field and an ‘inflaton’ field that would, in theory, generate inflation when its energy dominates other fields. Different inflaton fields have been proposed, each characterized by the potential energy they contain, and each generating different amounts of expansion as a result - just as a ball rolling down a hill will pick up different speeds depending on the hill’s height. In general, inflationary models share the broad prediction that the range of temperature variations in the CMB should follow a Gaussian distribution, or bell curve. So far, this has been borne out by the Planck data, providing strong support for inflation. In particular, the researchers note that as the Planck team narrowed down the list of possible inflaton fields, the models that best fit the data - known as ‘plateau models’ because their potential-energy profiles level off at relatively low energies - are far less likely to occur naturally than the models that Planck ruled out. 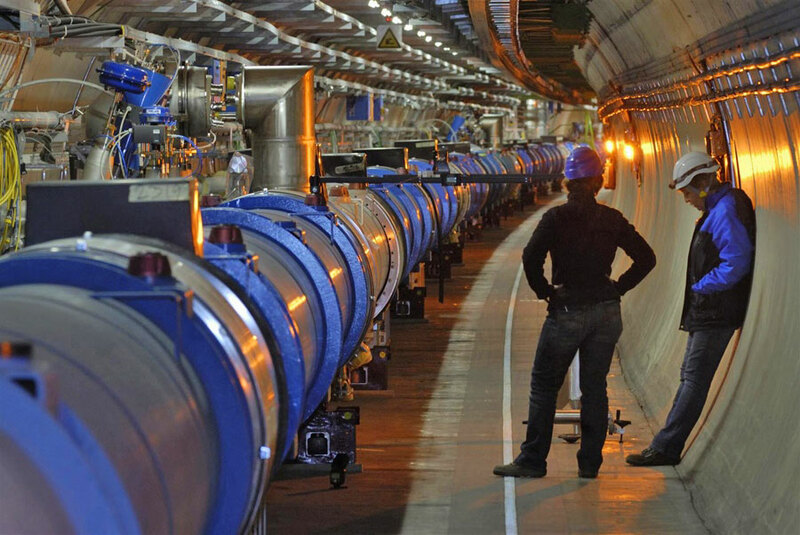 But the news for these plateau models gets dramatically worse, the researchers say, when the results are analyzed in conjunction with the latest results about the Higgs field coming from CERN's Large Hadron Collider (LHC) near Geneva. Steinhardt likens the odds of the Higgs field initially being perched in the precarious metastable state as to those of dropping out of the sky over the Matterhorn and conveniently landing in a "dimple near the top", rather than crashing down to the mountain’s base. Moreover, once inflation began, the quantum fluctuations generated would have quickly knocked the Higgs field off the metaphorical cliff’s edge of metastability and down to an extremely low-energy state. In some of the old inflationary scenarios, this would not have been an issue. But in the presence of a plateau inflaton, the falling of the Higgs from its perch would cause inflation to cease too soon, cutting off the Universe's growth. The young Universe would have been more likely to curl up into black hole than to grow into a fully-fledged cosmos, Steinhardt says. Steinhardt emphasizes that his analysis holds only because, so far, the LHC has not found any discrepancies with the standard model of particle physics. If future runs of the LHC discover exotic particles, then the energy profile of the Higgs will be recalculated accordingly. "But if you take the data we’ve been given and just follow your nose, then inflation and the whole Big Bang paradigm seem to be in big trouble," Steinhardt says. Steinhardt is no novice when it comes to making controversial cosmic claims. For many years, he and some of his colleagues have been developing an alternative 'cyclic model', in which the Universe undergoes a series of Big Bangs and crunches, repeatedly expanding outwards and contracting inwards. Unlike inflation, this framework predicts slight deviations from the smooth Gaussian distribution of temperature fluctuations. David Spergel, an astrophysicist at Princeton University who led an earlier analysis of CMB data collected by NASA’s Wilkinson Microwave Anisotropy Probe, agrees that there is confusion over how to explain the initial conditions that were needed for the Universe to emerge. "There are significant conceptual problems with all of our ideas about the early Universe," he says. Spergel also concurs that some cyclic models are compatible with the Planck data. Steinhardt’s concerns were discussed - but largely dismissed - last week by participants in a program on ‘primordial cosmology’ at the Kavli Institute of Theoretical Physics in Santa Barbara, California. Those participants included members of the Planck collaboration. "The authors claim that the surviving models are, in their words, 'unlikely' - which is an ill-defined concept," says Eva Silverstein, a theoretical physicist at Stanford University in California and an organizer of the program. "The response in the discussion here was pretty much the opposite." She notes that there are theoretically complete inflationary mechanisms that can produce viable plateau models. "I believe most people agree that there is much more to understand about the initial conditions preceding inflation," says Silverstein, adding that, however, "the big picture is that the Planck results are in striking agreement with the inflationary paradigm." Ade, P. A. R. et al. Preprint available at http://arxiv.org/pdf/1303.5082v2.pdf (2013). Ijjas, A., Steinhardt, P. J. & Loeb, A. Preprint available at http://arxiv.org/pdf/1304.2785v2.pdf (2013). Degrassi, G. et al. J. High Energ. Phys. http://download.springer.com/static/pdf/844/art%253A10.1007%252FJHEP08%25282012%2529098.pdf?auth66=1404430177_5b33e74361d23035e1e0a262ad027b35&ext=.pdf (2012). Planck Collaboration: Ade, P. A. R. et al http://arxiv.org/pdf/1303.5084.pdf (2013). Lehners, J.-L. & Steinhardt, P. J. Preprint available at http://arxiv.org/pdf/1304.3122v3.pdf (2013). …But in a separate paper also posted last week, Steinhardt and Jen-Luc Lehners, an astrophysicist at the Max Planck Institute for Gravitational Physics in Potsdam, Germany, argue that cyclic models remain viable, given the quoted error range in the Planck data.